Auto Glass Service, uses OEM (Original Equipment Manufacturer) quality replacement glass for the windshield on your car, SUV, cross-over, pick-up truck, van or company vehicle to ensure a safe, perfect fit. We use the strongest and best quality adhesives to secure your new glass in place and get you safely back on the road faster. Using the best quality adhesives available on the market, we offer a one hour safe drive away time in most weather conditions. 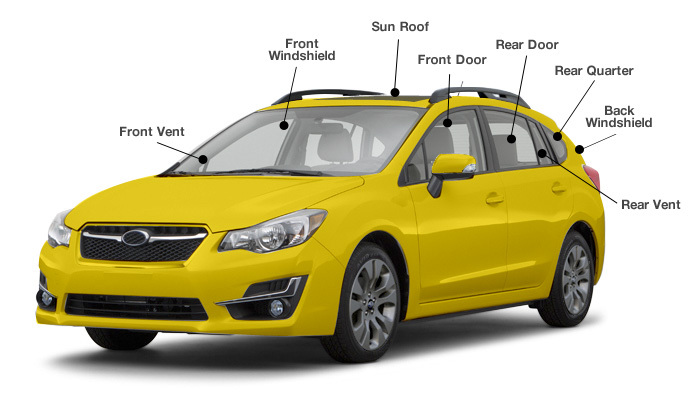 Depending on the severity of the windshield damage, we may be able to repair your windshield as opposed to replacing it. Click here to determine whether your windshield crack can be repaired or will require replacement. Outside of the windshield, the other auto glass will probably require replacement. Use the diagram below to help you when getting a quote. Using the highest quality materials is only one of the benefits to choosing Auto Glass Service. Our certified and trained technicians, lifetime warranty on workmanship, filing your insurance claim for you and free mobile service make it an easy, hassle-free choice. So whether it's a repair or replacement of your auto glass, call the experts at Auto Glass Service where safety is #1 and get the job done right the first time!